From the moment they were married, Rae was Ben's primary model and muse. Although she had no formal art education, walking "many museum miles" with Ben gave her understanding of what went into a good pose. She brought an ethereal grace, beauty and intelligence to her modeling that was an accurate reflection of who she was. Ben's renderings of Rae are a constant throughout his career. He painted or drew her in oils, watercolors, charcoal, pastel, pencil, and variety of other media. While comparisons have been to Cezanne's portraits of his wife, there is nothing quite like Ben's pictures of Rae in modern art. Rae once remarked, when asked about being the subject of many studies by Ben, "It could have been an apple, a daisy, or a bend in the road." In fact she came to represent "woman-eternal" (according to artist Albert Gold) in Ben's work. She would later remark that the work was of "someone I once knew." When asked how she and Ben met, she wrote to her friend, writer Helen Papashvilly, "On April 5, 1930, I was having dinner with this person, a mutual Philadelphia friend of Ben's, in the area of 72nd St. when he said 'Let's stop and see my friend Ben Solowey, the artist,' which we did do, only to have no one show! Nothing daunted, as they say, a month later, in the same general area, same routine but - an answering bell from Ben (his studio on the 5th floor) and looking up from the ground one, through a maze of banister - there was Ben. 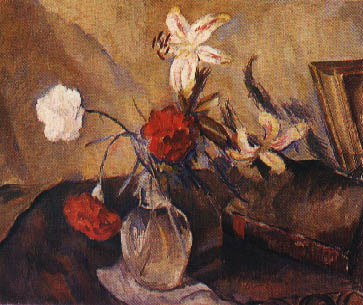 In retrospect, and accustomed as I am to Ben's present studio, in itself an art work, created, if you will, by him, the 72nd St. one was rather - unobtrusive, but on the easel, a jewel-like still life Carnation and Lilies. It has become part of me. As we were leaving, he asked if I'd have dinner with him the next night, but I was doing something else. The next night? The magic sesame - at dinner - he asked me to marry him, Said he would have done so the first night - except for this Person's presence! Difficult not to invoke the 'what if' syndrome - had Ben been off his premises the second time - that just might have been that." Ben's first portrait of Rae in 1930 was given to her mother, who later complained that the profile only gave her half of her daughter. Over the next five decades they developed an easy understanding that allowed Ben to capture Rae's unique personality. His 1938 conté crayon portrait is a simple, delicate delineation of a beautiful woman, while Tea of 1954 captures a domestic moment in Ben's Philadelphia studio.. The 1935 oil of Rae in a Green Dress captures the artist's wife in the New York studio framed on one side by a Japanese style folding screen that Ben had made, with a Solowey landscape of Cross River, New York acting almost as window behind her. Ben never shied away from painting hands, and in this work seems to emphasize Rae's wedding ring on the hand in her lap. The green dress is something Rae would wear through her many years posing for Ben. In the 1956 casein, Leisure, Rae is in the Bucks County studio in a favorite pose: reading. Ben has included several still lifes in the background, as well as another on the table. In the background is also a sculpture in clay still on its armature. This work was never completed to Ben's satisfaction. To Rae's right, the door of the studio opens to an imagined landscape. The ground outside is a pool of color and Ben has included the wall of one of the colonial outbuildings on his property. In Young Woman with Still Life of 1947, Rae strikes a similar pose, but this time she seems to have tossed off her reading material and is waiting. The unruliness of the still life to her left competes with the orderly rendering of paneling on the Bucks County studio wall. Rae also aided Ben in restoring their 34 acre farm, and created an warm atmosphere for her husband and their guests, whether they be friends or patrons. Her steady stream of letters provide readers with a history of the Solowey studio in a unique and compelling voice. It was Rae who had the foresight to keep Ben's studio in Bedminster, Pennsylvania intact for present and future generations to experience and explore. She died in May 1990, on the twelfth anniversary of Ben's death. © 2008 The Ben Solowey Collection. All Rights Reserved.